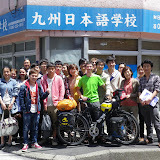 Sam san, from France , has been studying with us since Oct.2011 left Kagoshima today. He is going to Hakkaido with his bicycle. We miss you! Take care! See you! 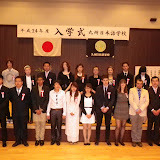 We had an Entrance ceremony on 10th Apr.2012, New students 24 members from China,Vietnam,Spain,Russia,Nepal and Korea join our school. Congratulations!